An Android smartphone forms the heart of the STRaND-1 nanosatellite shown here, which will be launched by the British company Surrey Satellite Technology Ltd. in 2011 as part of a technology demo flight. Cell phones have spread to every corner of the globe. Now their reach is about to extend even farther — into space, where they could serve as the brains of future microsatellites. British researchers have developed a tiny satellite containing a smartphone payload, and they plan to launch it this year. The goal is to show what a satellite can do when it is built quickly and cheaply from commercial off-the-shelf components. The smartphone payload costs less than $480 (in Britain, 300 pounds), and the entire satellite — called STRaND-1, for "Surrey Training, Research and Nanosatellite Demonstrator" — is cheaper than a family car, researchers said. The entire STRaND-1 project is expected to cost just under $400,000 (250,000 pounds), including launch expenses, according to news reports. STRaND-1 weighs just 8.8 pounds (4 kilograms), researchers said. "If a smartphone can be proved to work in space, it opens up lots of new technologies to a multitude of people and companies for space who usually can’t afford it," Chris Bridges, lead researcher for STRaND-1, said in a statement. "It’s a real game-changer for the industry." STRaND-1 is a joint effort of space researchers at the University of Surrey in the United Kingdom and the company Surrey Satellite Technology Ltd. 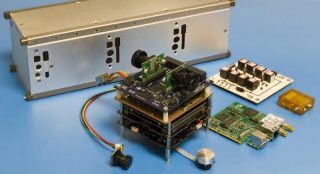 The team thinks smartphones make an ideal satellite payload, because the gadgets pack a lot of advanced components — such as sensors, video cameras, GPS systems and Wi-Fi radios — in a tiny and relatively cheap package. Smartphones also offer the possibility of frequent functionality upgrades, according to researchers. "Because many smartphones also run on free operating systems that lend themselves to online software developers, the creators of applications for smartphones could feasibly develop apps for satellites," Bridges said. The smartphone payload will run on Google's Android operating system, though the phone model hasn't been disclosed yet, according to news reports. STRaND-1has been outfitted with a smartphone avionics software suite, and it incorporates advanced guidance, navigation and control systems, as well as pulse plasma thrusters to propel it through space. Cell phones aren't designed for the rigors of space, so the team will put its payload through extensive ground-testing prior to launch. Researchers will also perform a series of tests in orbit, to make sure the smartphone is operating correctly, officials said. A powerful Earthbound computer will assess the vital statistics of the phone when it's in space. Once researchers are satisfied that everything is going well, they'll let the smartphone operate parts of the satellite. Though the satellite is still resting on terra firma at the moment, researchers are happy with the progress they've made, and they expect big things from little STRaND-1. "It’s exciting to see how the team have managed to create a satellite with such incredible performance," said Doug Liddle, head of science at Surrey Space Technology.